Board Members Layla Abou-Taleb, Dr. Tony Torng, Larry Redinger, Cindy Ruiz, Helen Hall, and Superintendent Dr. Robert Taylor recognize Coordinating Council President Lily Eibert for dedicated service to the Walnut Valley Unified School District. WALNUT — The Walnut Valley USD Board of Trustees recognized exemplary students and parent volunteers from Diamond Bar and Walnut High Schools during the May 16 meeting. 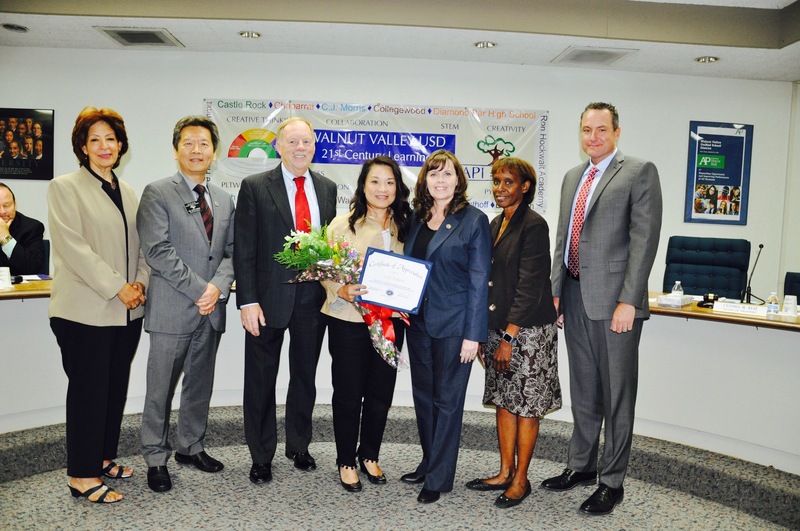 Diamond Bar High senior Marisa Umeh was honored with the Super Star Student Award. Marisa has a passion for filmmaking and publishing. She created a film about women’s health at the Girls Impact the World Film Festival organized by the Harvard Social Innovation Collaboration. Last summer, Marisa was selected to attend the Women’s Science STEAM Initiative in Malawi, Africa as a U.S. Department of State Youth Ambassador. Marisa serves on the Junior State of America State Cabinet, yearbook editor, mock trial team, and hosts a web series titled #LikeHer in which she interviews influential women in typically male-dominated fields. She will attend UC Berkeley and plans to work in international human rights law and virtual reality corresponding. Parent Rachel Chang received the Partner in Education Award. Rachel has served as the Mag 7 President for the past four years. Mag 7 is the parent organization that coordinates the school’s seven parent groups: Brahma Boosters, CAAP, CAPA, HOPE, KAPA, SAPA, and Brahma Foundation. Rachel has helps support Open House, Rodeo Round-Up, Back-to-School Night, Staff Appreciation Luncheon, and many more school activities. She has also served as president of the Korean American Parent Association (KAPA) for the past six years. KAPA has donated numerous supplies for the school including microphones for classrooms and monitors for front office. “Rachel is truly a partner at Diamond Bar High and helps us in so many ways!” said Principal Rueben Jones. Walnut High senior Adam Ng received the Super Star Student Award. Adam is an extremely motivated, academically driven, and disciplined student. His rigorous academic program and campus activities are a testament to his maturity and focus. Brandon has been involved in FBLA, Model of United Nations, Speech and Debate, Mock Trial, Class of 2018 President, Varsity Basketball, MIT Launch club and Health Occupations Students of America. As the Inland Section President of FBLA, he has created a liaison system for 32 schools in the Inland Empire. Adam is the southern California Area 7 Director of the Rotary Interact Organization, CEO of the “For All Mankind” club, and President of the WHS Hoops4Hope club and FBLA. “Adam’s service club involvement is spectacular!” said Principal Brandon Dade. Adam aspires to work in public policy or corporate law. He hopes to become an attorney and eventually an ambassador for the government.